From its headwaters in the Bradshaw Mountains near Prescott to its juncture with the Gila River near Arlington, Arizona this 179 km river of life through the arid Southwest passes through a wide variety of life zones. At the highest elevations of 2200 meters it flows among cool pines and firs. Then piñon and juniper trees with plenty of open space between them. At mid elevations, 1500 m down to about 1000 m the Hassayampa passes through the fire-adapted habitat known as Interior Chaparral interspersed with various oak woodlands and desert grassland. Before the Hassayampa reaches Box Canyon the vegetation along the river's course changes to Upland Sonoran Desert scrub. At its juncture with the Gila River the vegetation has grown sparse and ever more xerically adapted. Over millions of years, abundant gravel, sand, silt and clays have been carried down from the Bradshaw Mountains with layer upon layer deposited within the channel and on adjacent river terraces. Most of the year much of the water flow is thus subsurface, flowing silently and unseen between the grains of sand. Some stretches of the river are too steep and narrow to retain much alluvial accumulation with the consequence that water flowing underground through the permeable base emerges and flows free as a river. The Nature Conservancy's Hassayampa River Preserve lies at such a point a few kilometers southeast of Wickenburg. South of Wickenburg the river disappears from the surface and only flows above ground after periods of heavy rain. We parked off Rincon Road from where deep-sand enabled vehicles continue on. From there we walked, getting our feet wet, up through to the ’Box’, about 3 km. The heavy traffic of motorized vehicles of many sorts stayed mostly on beaten tracks avoiding getting stuck in deep sand. There were also plenty of quiet folk on horseback. We were surprised the horses didn't spook with the passing loud engines and rowdy folks. Gold seekers were panning while the whine of engines was breaking the golden silence. The wash is wide and there are some undisturbed spots adjacent. Rocky ledges and terraces are well vegetated with cacti and shrubs. In short the visit for a nature lover is not perfect, but walking is easy and the diversity of plant life between the riparian strip and rocky slopes is high. View Larger Map - Good parking entrance for Hassayampa Box Canyon is marked by Trekker's symbol while the Box is noted by arrow w/ star. Blue balloon shows location of turn from highway US-93. Green tree symbol east of Wickenburg on US-60 is location of Nature Conservancy's Hassayampa River Preserve. Directions: From the Phoenix drive northwest to Wickenburg via US-60. Take the US-93 turn north from Wickenburg. Shortly there is a turn to the northeast onto Rincon Road. Cross a broad, usually dry section of the Hassayampa then continue a few kilometers more before arriving close to the river bed. Scenic Loop Road continues onto the northwest. White-throated Swift -- Spring-Summer-Fall - common around the steep cliffs approaching entrance to the Box. With so many noisy humans it isn't a surprise none were seen (but they were there). 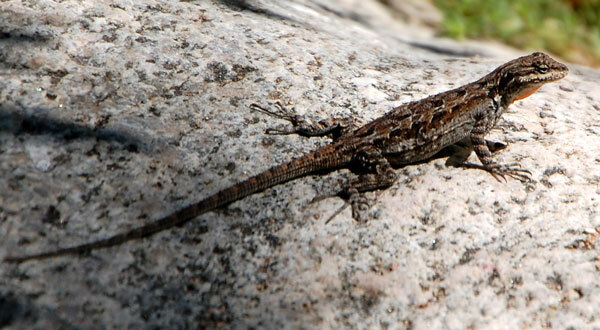 Tree lizards climb both trees and rocks and spend a lot of time basking. White Ratany -- Krameria grayi sp. Desert Honeysuckle -- Anisacanthus thurberi + Elada Checkerspot Butterflies! Woolly Bursage releases a very pungent odor when crushed. It grows along the sandy banks of the Hassayampa. Prickly Poppy -- Argemone sp. Popcorn Flower -- Cryptantha sp. 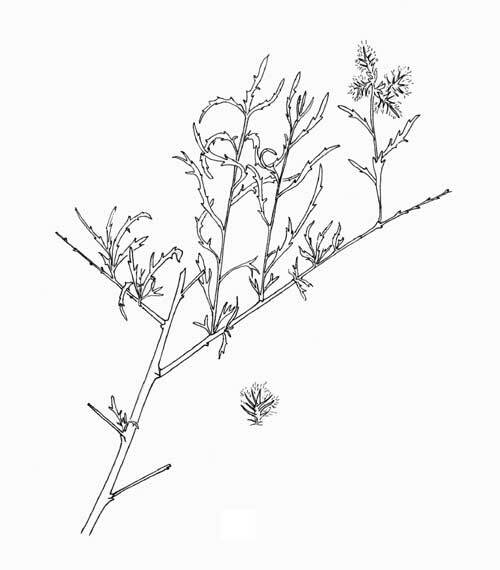 Ocotillo -- Fouquieria splendens spp.